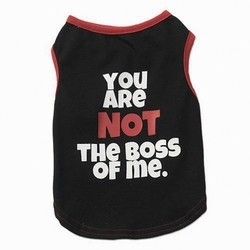 Perfect for the dog that may not have done so well at obedience school... This shirt from PetRageous Designs is full of attitude! Let the world know your adorable pup is packed full of trouble with this adorable t-shirt from PetRageous Designs. Features red hems on the sleeves and collar that pop against the blue tee. The back has a name tag style design that reads, "Hello My Name is Trouble." Easy pullover style and lightweight, comfortable fabric. Poly/cotton blend. Machine wash cold, tumble dry on low. Click image to enlarge Imagine your darling pet in this cute t-shirt! • X-Small: Chest 14" Length 7-9"
• Small: Chest 18" Length 10-13"
• Medium: Chest 22" Length14-17"
• Large: Chest 26" Length 18-21"